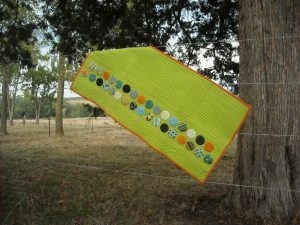 I have a new pattern out, and best of all . . . it’s FREE! 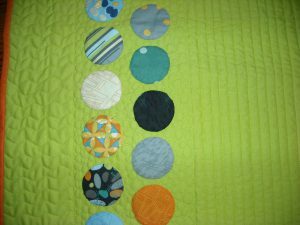 You can use your favorite method of applique to attach your bubbles, but no matter which method you choose, this is still a very fast and very easy project. You could have a passel o’ Christmas gifts whipped up in no time! 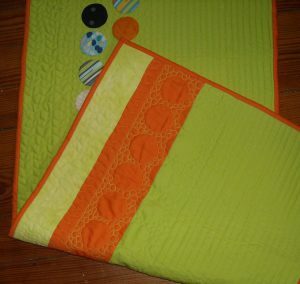 For my table runner, I used the new line by Brigitte Heitland of Zen Chic for Moda, called Barcelona. Brigitte and I met online years ago, back when we were both shopping for longarm machines. We’ve since met several times in person, even though Brigitte lives in Germany! If you’d like to visit Brigitte’s blog, you can find it HERE. Now, Brigitte is a fabric designer for Moda, and me . . . well . . . I have a longarm machine . . . When I was in Portland last spring for Quilt Market, I stopped by Brigitte’s booth to visit with her, and she gave me a candy pack of her new line, Barcelona, and I knew I wanted to use all the pieces together, so I designed this table runner to do just that. And naturally, there’s the requisite outtake shot from the photo shoot, where I had more help than I could even handle — Patch, Midnight, and Scotchie are excellent helpers! 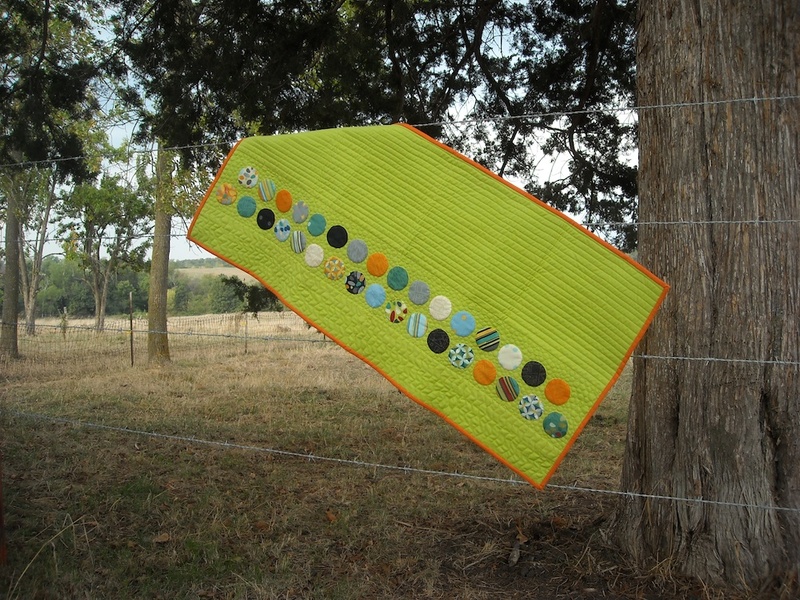 If you make yourself a Barcelona Bubbles table runner, I’d love to see it! Send me a picture . . . Thanks for the new pattern! I love the photo of the quilt and cats! I saved the pattern in a file I have just for your designs! Isn’t that cool? Love the pattern! Love the story of your friendship even more! Congratulations on the new pattern Shelly! It’s so pretty, and I love the fabric line you chose. So cool that you’ve met Brigitte several times considering the distance between you two. Great pattern. Love the way that yours turned out. Thanks for sharing such a cute pattern! 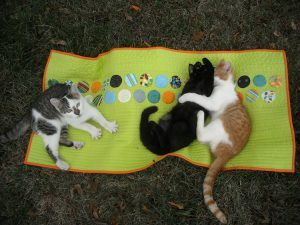 I have to say the kitties in the outtake photo did it for me! Oh my goodness they are cute. Patches was totally into the camera shoot, while Midnight and Scotchie were oblivious of their new claim to fame!